In response to the many questions received on how to look after caterpillars here are 10 easy steps to follow. As highlighted in the introduction to rearing butterfly and moth caterpillars, anyone regardless of age and experience can learn how to rear these magnificent insects. It really is possible to witness one of the wonders of the natural world taking place in your own front room! This guide is intended to help those wishing to start by raising common species. Not all caterpillars are suitable for rearing, collecting or release. Contact local conservation groups for advice if uncertain. 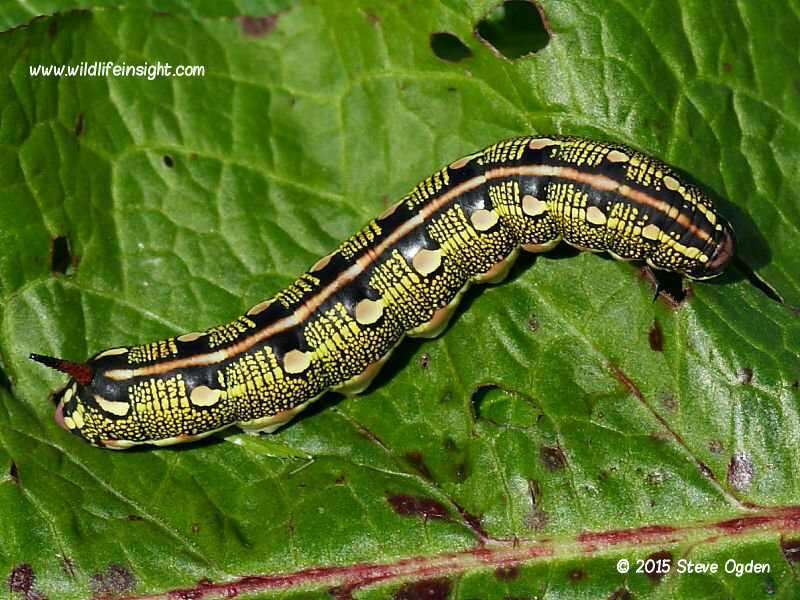 Caterpillars and larvae refer to the second life-cycle stage of a moth or butterfly. Larva is generally considered as being a more scientific term but here ‘caterpillar’ is used being the term more people are familiar with. Pupa and chrysalis both refer to the third life-cycle stage. 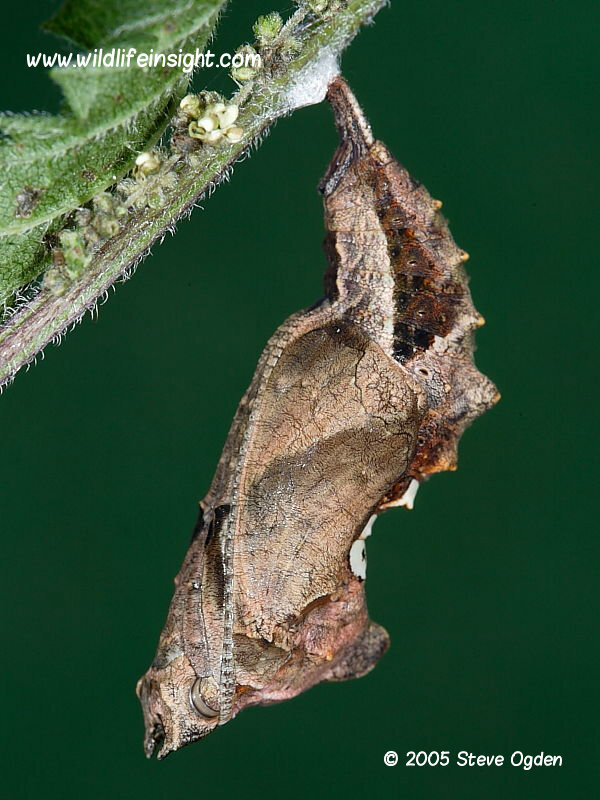 It is the norm to refer to moth pupa and butterfly chrysalis. A cocoon is a protective pupa outer casing. 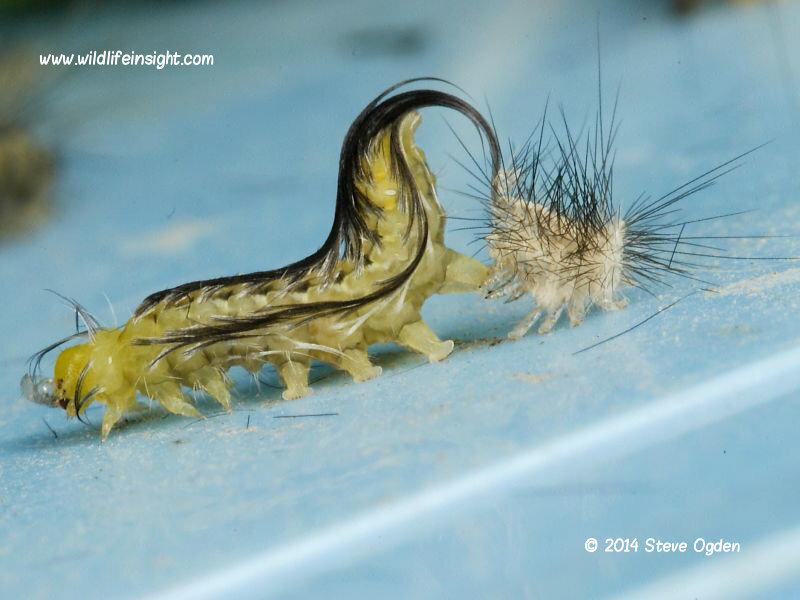 Some countries have species of caterpillar with stinging (urticating) hairs! Having found a caterpillar and wishing to rear it the first step is to identify it. To be able to rear a caterpillar successfully it’s necessary to know its requirements. Different species feed on different plants. Many have variable development and emergent times. Those with more complex life cycles and specific requirements are best left to the more experienced. Knowing the foodplant not only tells you what to feed the caterpillar on but may also help with its identification. Normally the foodplant is the one the caterpillar is found on but not always. Many fully grown caterpillars leave the food plant to wander in search of somewhere to pupate. Others will leave the foodplant to bask in the sun or go in search of a fresh food source. If the identity of the caterpillar is already known information on what it eats is readily available. Many different household containers or commercially available rearing butterfly ‘houses’ and netted cages are suitable. However glass jars are not recommended as they are difficult to ventilate, easily heat up and are more difficult to access. Plastic containers and not wooden or cardboard boxes are my preference for most moth caterpillars as they are easier to keep clean. 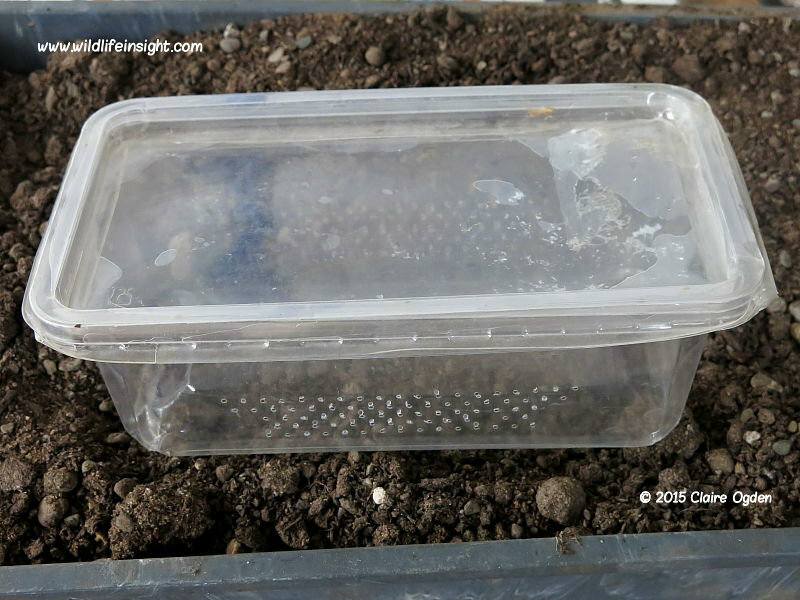 Many species can be successfully reared in plastic boxes as little as 4 inches x 8 inches (100mm x 200mm) provided they have enough small air holes to help prevent fungal growth and condensation. The caterpillars of many butterflies and larger moths are best kept in larger ‘butterfly houses’ or larger containers as they require more space to pupate and for the emerging insect to freely inflate its wings. 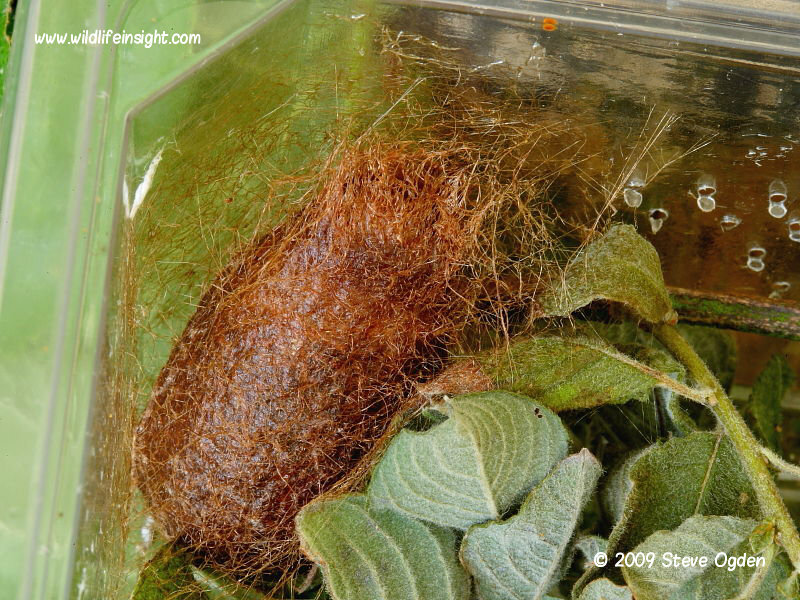 Netted ‘housing’ is excellent as it allows free air circulation and a good structure on which pupation can take place. 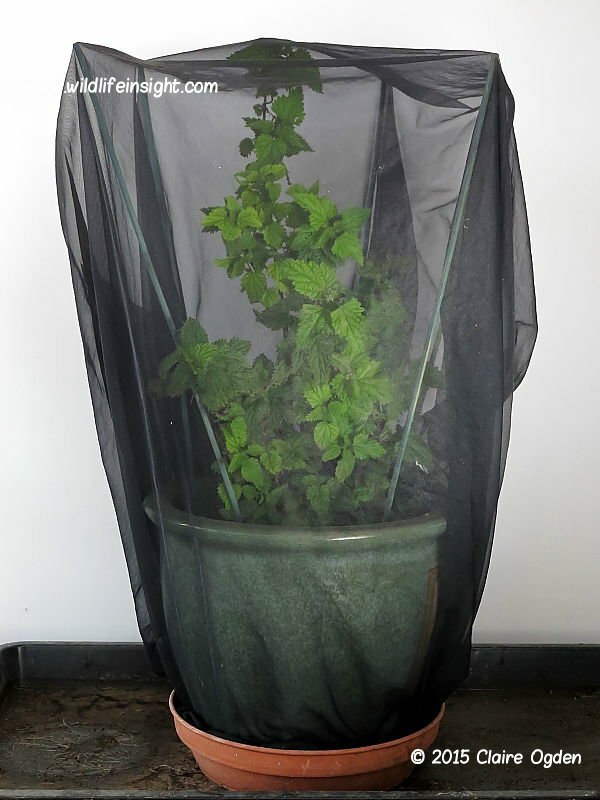 Fine meshed netting is necessary to prevent small caterpillars escaping and exclude parasitic flies and wasps. Netted cages and clear plastic containers also enable the caterpillar to be observed from outside without disturbing it. And, after all, much of the enjoyment and learning comes from watching what a caterpillar is doing. It’s also particularly important to know when and where a caterpillar is pupating. Not only is watching a caterpillar pupate one of the highlights of rearing but many species spin a cocoon or suspend themselves from the tops of containers and cages, often over access points. And knowing where and when it’s pupating will prevent you from disturbing it or damaging it by opening. Many caterpillars can be successfully reared inside the house, with most rooms being suitable. However, areas of rooms exposed to strong sunlight such as window sills should be avoided. Plastic containers heat up very quickly. Unnaturally warm conditions can lead to premature emergence, condensation and drying out. Avoid extremes in temperature and try to replicate as near as possible the temperature the caterpillars would experience outside. The dry air of centrally heated rooms can cause the drying out of pupae/chrysalis. The amount of light isn’t as important as temperature variation but if rearing on a growing plant lots of natural light is required to keep the plant healthy. Caterpillars that overwinter should be left to the more experienced as they often need more specific overwintering conditions with some having to be placed outside. 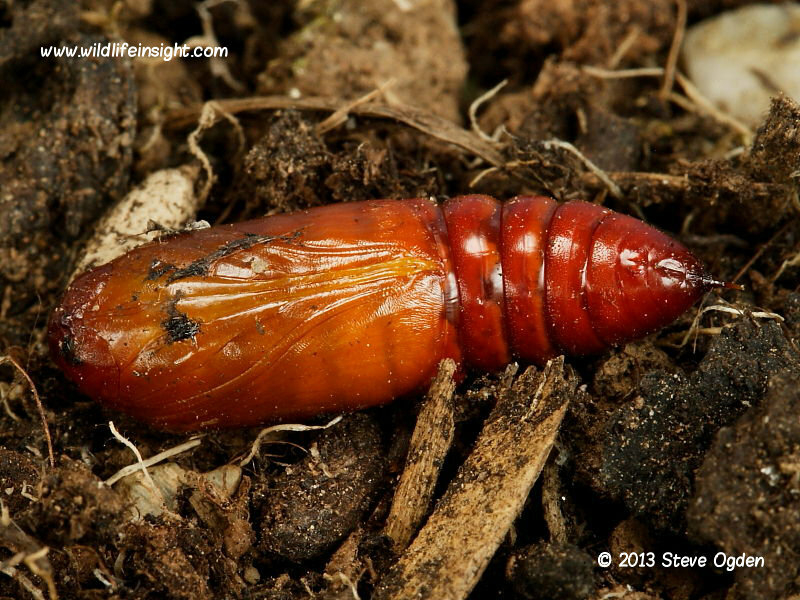 Over wintering pupae require cool or even cold conditions and are best moved to outhouses, garages and sheds. Fresh and sufficient food is critically important for the healthy development of a caterpillar. Small cuttings of the foodplant should be added each or every other day and old food discarded. Adding more cut food than a caterpillar can eat in one or two days is unnecessary and can make finding small caterpillars more difficult when removing old uneaten plant. An excellent way of keeping cut leaf stems fresh for longer is to put them in a simple flower arranging oasis placed in a small pot containing a little water – taking care to ensure the caterpillar cannot fall into the water. Having a healthy food plant already growing in a pot is a very successful way to rear caterpillars. By putting the caterpillar on a plant in a butterfly house or netted cage it’s often possible to sit back and observe until pupation without doing anything other than occasionally water the plant and clear out any excess frass. 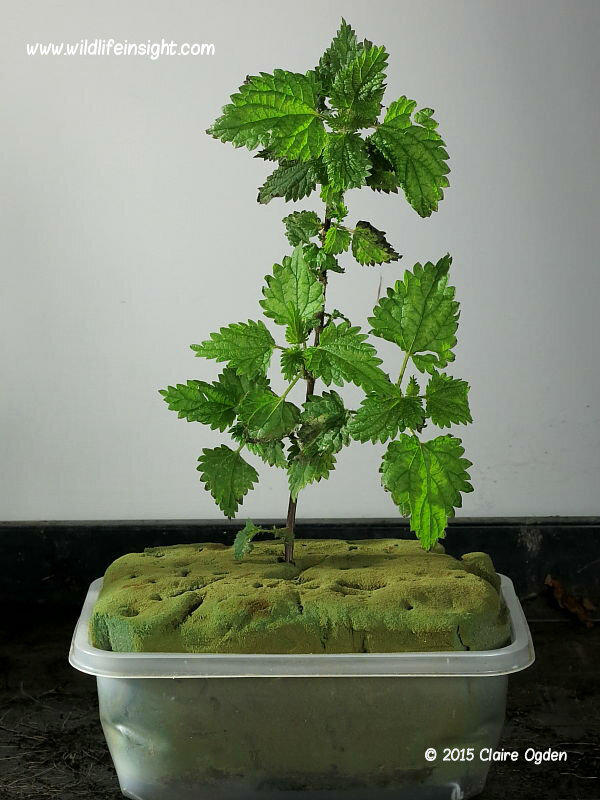 Nettles are an excellent plant to pot up in preparation for getting started as they are the main foodplant of many common species of moth and butterfly caterpillar. Care should be taken not to introduce spiders, earwigs, slugs, snails and parasites when collecting food. 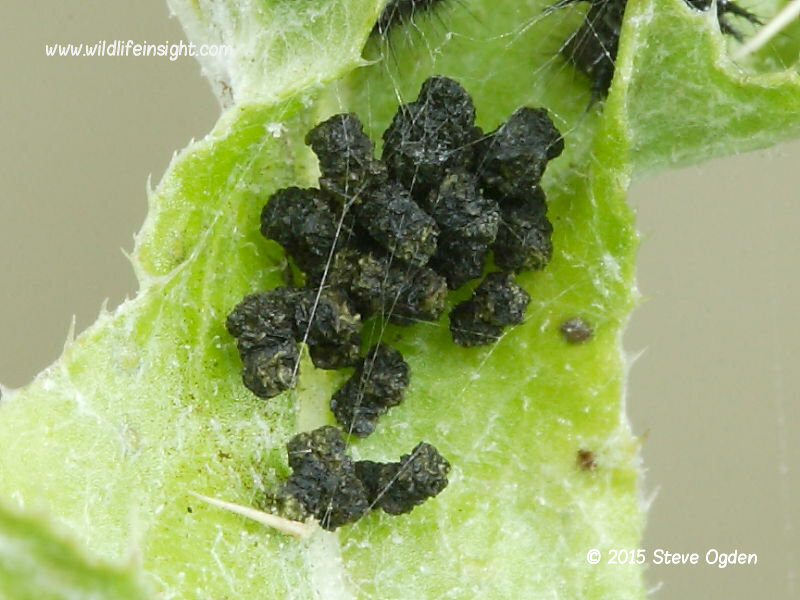 Tiny caterpillars or eggs of other moth or butterfly species may accidentally be introduced on collected food plant – but these can be a real bonus. 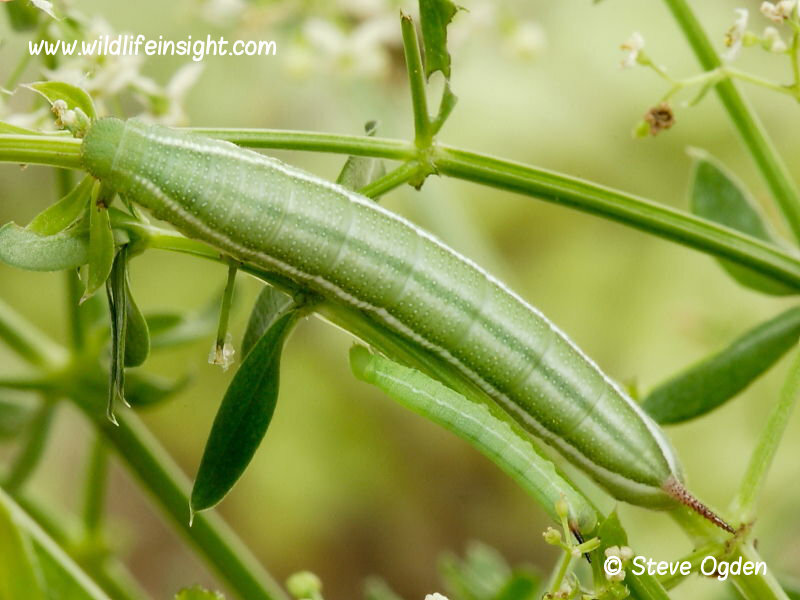 The Elephant Hawk-moth caterpillar shown left (the smaller one) was brought in as an egg on Hedge Bedstraw being fed to Hummingbird Hawk-moth caterpillars. Why does a caterpillar stop feeding? There are several reasons why a caterpillar may not be feeding. It may have the wrong foodplant. It may be preparing to moult or pupate. It may be too cold or hot. Although handling caterpillars should be kept to a minimum it’s often easiest to remove them when cleaning out and replenishing food. I find the easiest way to move a caterpillar is on the leaf or stem it’s on – so avoiding direct contact. When not on a leaf a soft artist’s brush can be used to gently brush the caterpillar onto a spoon – this is a particularly good method when moving delicate tiny caterpillars. Please note some caterpillars have stinging (urticating) hairs and skin contact should be avoided. Caterpillars are feeding and growing machines. It never ceases to amaze how quickly some grow and how much they discharge. For many species this is the most vulnerable stage of their four part life-cycle. So part of a caterpillar’s survival strategy is to become fully grown and pupate in the shortest period of time possible. Consequently they feed voraciously and much of what goes in comes out as frass (droppings, poop). This frass needs to be removed rather than allowed to build up and encourage fungal growth. If kept in a plastic container it’s easiest to lift out the leaf holding the caterpillar before tipping the container upside down and cleaning. The leaf, hopefully with caterpillar still on, can then be put back in the container on top of fresh foodplant. A single sheet of kitchen paper on the base of the container can also be useful for soaking up any surplus moisture and frass. 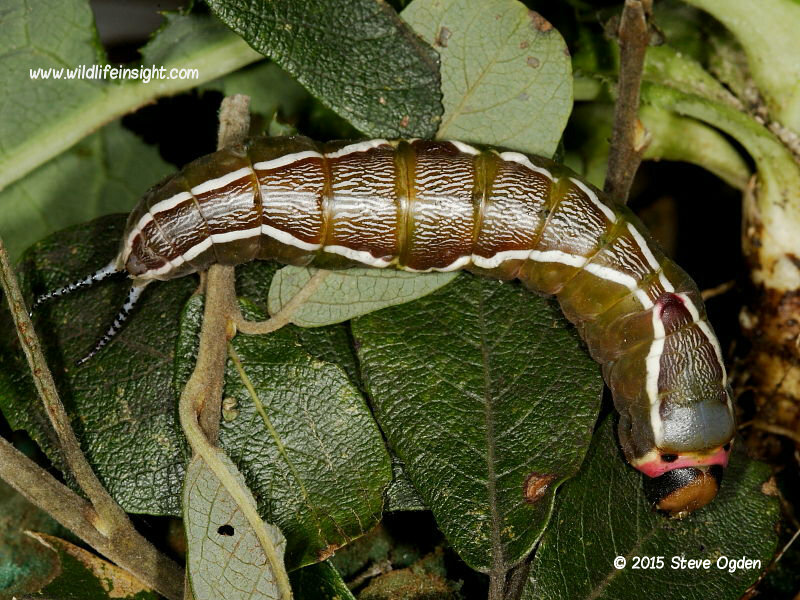 Most caterpillars change their skin (moult) 5 or 6 times to accommodate renewed growth. The stages between moults are referred to as instars. It’s extraordinary to watch this transforming process as it discards its old skin for a fresh one. 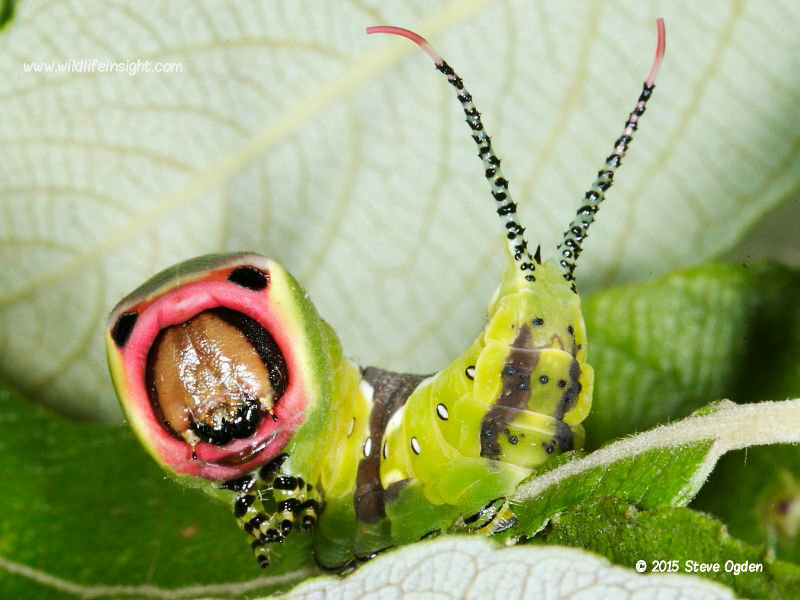 During this process many caterpillars radically change their appearance – rather like us changing clothes. When moulting the caterpillar is particularly vulnerable so shouldn’t be disturbed. Some caterpillars will eat their old skins. When is a caterpillars going to pupate? After a particularly heavy period of feeding a fully grown caterpillar will stop feeding and often begin to restlessly explore the container searching for a place to pupate. Just prior to pupating many species darken, lose colour, shrink and become lethargic. Others such as the Puss Moth (above) and Lime Hawkmoth dramatically change colour turning a reddy/purple. 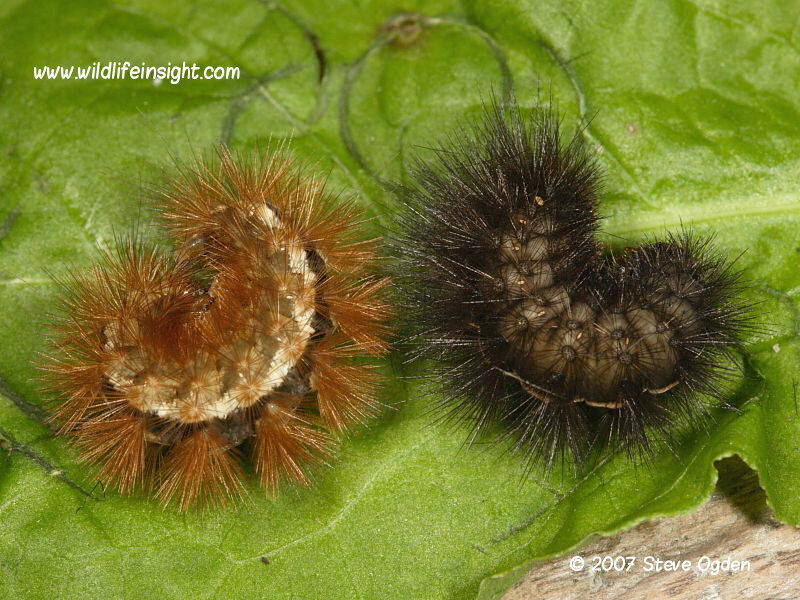 Hairy caterpillars such as the commonly found woolly bear Tiger Moths that pupate inside a cocoon will start spinning using silk and hairs to form cocoons amongst leaf and plant litter. 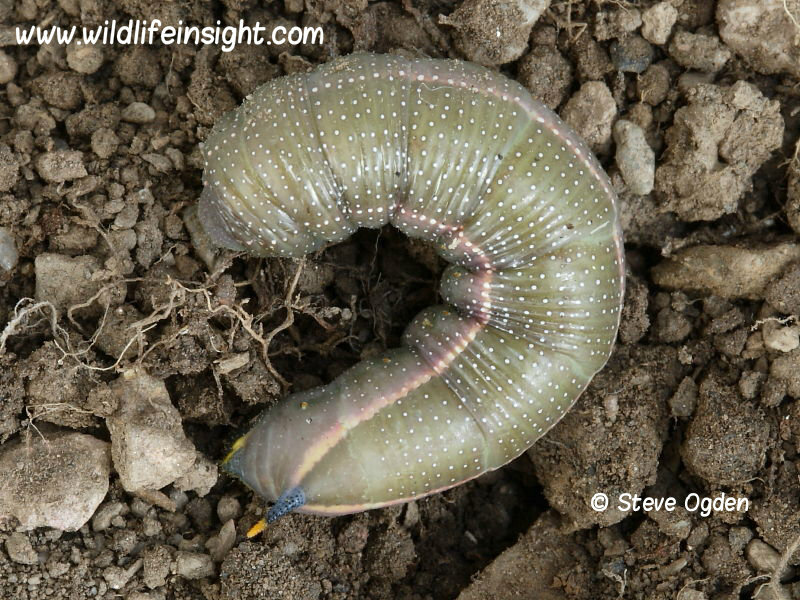 Other caterpillars including those of the many species of large Hawkmoths bury themselves just below the surface of the soil or in leaf litter. 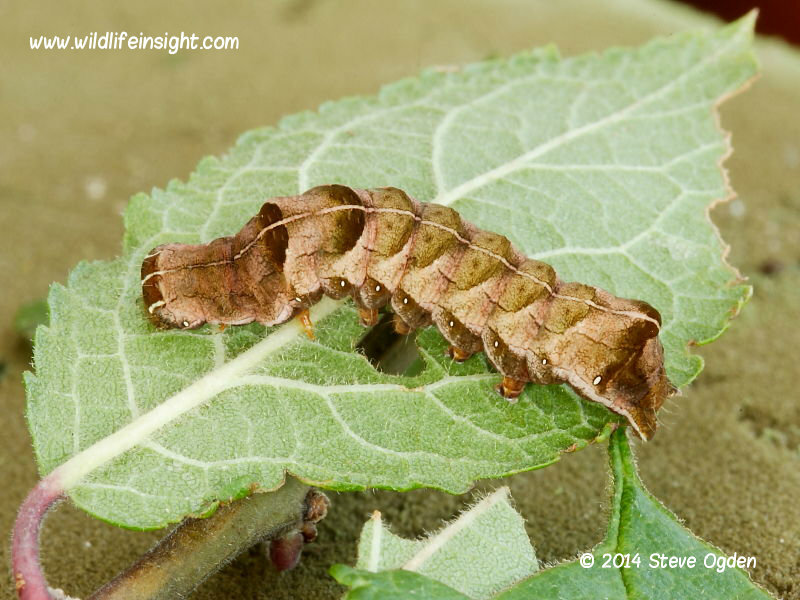 Fully grown caterpillars need to be provided with the appropriate conditions to pupate successfully. Plant stems, leaf litter, bark, wood or a little soil should be added depending on the species. Many species of butterfly caterpillars require adequate space and structures such a plant stem or netting from which to hang from and form a chrysalis. 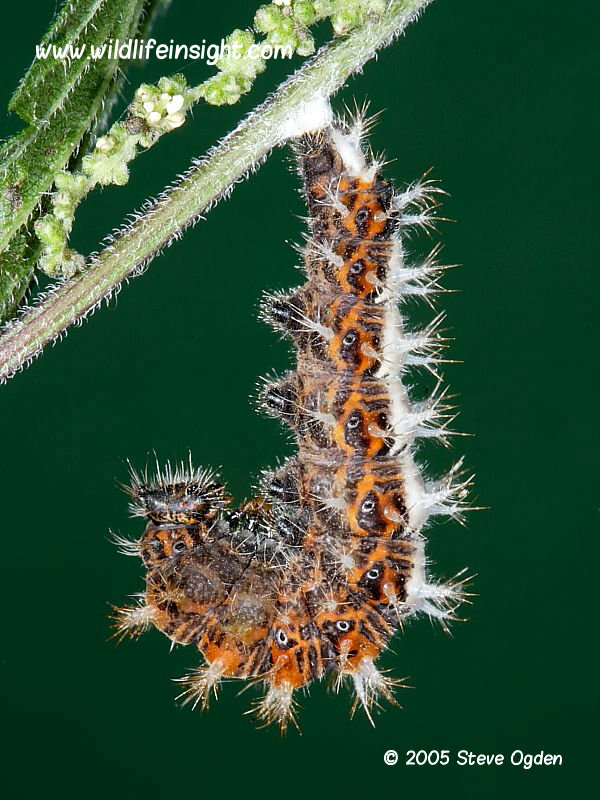 The photos above and left are of a pupating Comma Butterfly caterpillar suspending itself by attaching its cremaster to a silken pad on the underside of a nettle stem. For the many moth species that pupate in the ground a shallow layer of soil should be added. It’s always best to check for predatory creatures such as spiders and earwigs in introduced soil. Placing the soil in the microwave for a few minutes is a good way to sterilise it. Caterpillars should not be disturbed while in the process of pupating. Inside the pupa a remarkable transition is taking place. Once pupated the food source should be carefully removed and frass cleared out to prevent decay and fungal growth. An occasional fine spray of water may be necessary to prevent pupae from drying out but care should be taken not to over wet. Surplus moisture can be absorbed in kitchen paper. Species that emerge in the same season generally don’t have to be moved from where the caterpillar was reared. In the Autumn/Fall as the temperature drops overwintering species should be put in a cool place as over heating can cause premature emergence and centrally heated rooms cause the pupae to dry out. Many species do best overwintering in unheated rooms/outhouses. While others require to be exposed to the full severity of the winter outside. It’s easy to forget those overwintering outside. Wooden garden sheds can heat up very quickly in early Spring sunshine, resulting in premature emergence. I bring those pupae that have overwintered outside into my unheated study in early Spring. Earlier if an early emerging species. There I can keep a closer eye on them. In the days leading up to a butterfly or moth emerging pupae often darken and begin to shake and twitch. The outline of wings and antennae may also be visible. Many species emerge within 2-4 weeks of pupating, others overwinter and some species may not emerge for a year or more. Temperature influences emergence with artificial warming inducing earlier emergence than in the wild. My own preference is to try and replicate the temperature experienced naturally so emergence coincides with those of wild broods. It is very important to ensure that the emerging moth or butterfly has something to crawl up such as netting or a plant stem. An emerging insect requires space to fully inflate its wings and cramped conditions can lead to damaged wings. During emergence the insect should not be disturbed. It’s always best to check pupa early in the morning as many species often emerge during the night. Watching them slowly inflating their wings early the next morning is something not to be missed. Occasionally, for no obvious reason, a moth or butterfly doesn’t emerge or wings don’t form properly leaving the insect unable to fly properly. The most common causes for butterflies or moths not emerging are parasites and drying out. Many caterpillars such as those of the common Large White butterfly already have parasitic larvae growing inside them when collected from the wild. In such cases there is nothing that can be done to save the butterfly. This is part of nature and something not to get too upset over. Having successfully managed to rear a moth and butterfly releasing it is a moment to really savour. Once fully formed and ready to fly the adult (imago) butterfly or moth is ready to be released. Most moths should be released at night to prevent them being eaten by birds. 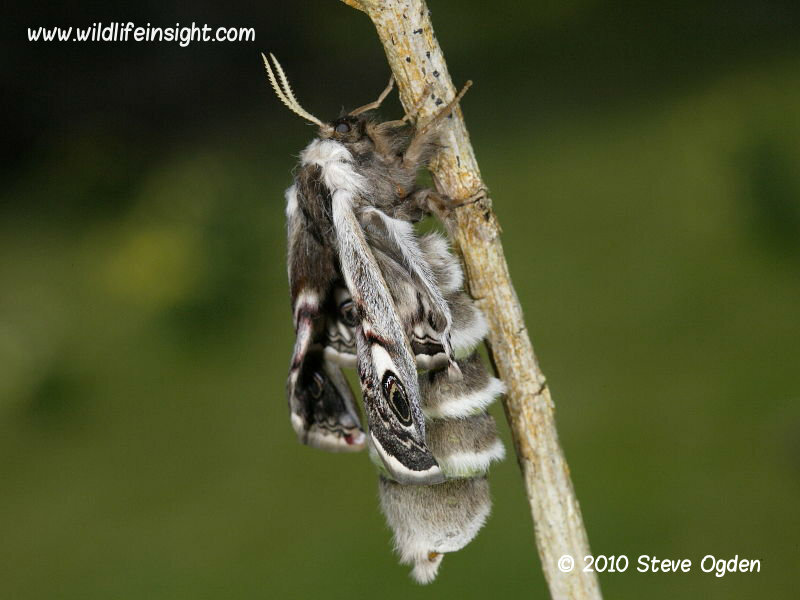 Although there are some day flying species such as male Emperor and Vapourer moths that can be released during the day. Butterflies should be released on a warm sunny day. Moths and butterflies should be released where the caterpillar was found. Species should not be released into an area where a population doesn’t already exist or on Conservation sites requiring permission.